Costs – Durham, North Carolina arborists charge a variety of prices for their services: tree removal, stump removal and maintenance. Find the averages here. FAQs – See what trees thrive in Durham versus which might be better off in other climates so you don’t have to uproot a dead tree halfway through the year. Services – Contact an arborist near you to keep your trees healthy year-round. How Much Do Tree Services Cost in Durham? If you are looking for quality tree service cost in the Durham, NC, area, it is important to do some cost comparison before you select a reputable and trustworthy company. Prices can fluctuate because tree and shrub servicing requires a variety of different skills and equipment. Removing unwanted trees and shrubs can be challenging or impossible unless you have the right tools. Calling a professional tree removal service will help rid your property of diseased vegetation and trees, which helps to create a nurturing environment. For tree removal services in Durham, you can expect to spend between $500 and $700. These prices can fluctuate based on a number of factors, including tree & shrub types, height, location and size. Overgrown shrubs and trees that require a lot of trimming before removal can raise the price. Trees that are very tall and that come in contact with electrical wiring or components may require additional work to remove. All of these factors must be considered when providing an accurate estimate. After the tree is removed, you will be left with a stump. This can add into the cost of removal, but in some cases, a tree-trimming company may or may not offer this type of service. It requires a grinder and mulcher. Not all tree removal companies have this. The average cost of grinding a large stump is around $133. Maybe you just need your trees trimmed. The cost of pruning, cutting and maintaining your trees usually falls between $598 and $862. These prices may fluctuate depending on the area that you need trimmed as well as how often you will need bushes manicured and branches cut. You may receive a discount if you set up routine maintenance and have your yard serviced on a regular basis throughout the year. Specialized trimmings in the spring and fall months can be more expensive. Durham, North Carolina, located in the Eastern U.S. is home to more than 96,000 acres of natural forest. This includes the Piedmont Bottomland Forest which is abundant in trees, shrubbery and plant life. If you are considering planting new saplings or want to learn more about the trees and shrubs currently growing on your property, there are a few things to take note of. Avoid cutting or trimming trees and plants within 32 feet of public property. Designated trees or shrubs belonging to the city or that are on private property must not be trimmed. Shrubs or trees on your property that overlap onto city streets or sidewalks must be trimmed at your expense. Trees should not cover up or block public utilities, water meters or fenced areas. The City of Durham does not recommend planting any tree or shrub within six feet of a city power line. Failure to abide by this ordinance can result in fines and ticketing. If you have trees that you want trimmed and they border the city property or private property, contact the Durham City Planning Department. They will advise you on what to do and what permits to obtain for safe and legal removal. Early spring is the best time for tree removal in Durham. This is before the trees start to bud and new branches grow. 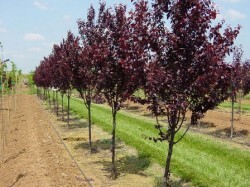 This will ensure that trees that can be salvaged are not harmed during the trimming process. There are many popular trees known to the Durham area. The state tree, the pine, is found around the city of Durham as well as many surrounding rural areas. Two of the most popular trees, the birch and the white pine, offer a lovely contrast to each other in backyards and rural areas. Pines and birch trees thrive in the North Carolina climate and in Durham especially. North Carolina can receive several inches of rain and snow each year, and these trees are tolerant of extreme climate changes. Fruit trees also thrive in Durham. Most require annual care and maintenance from an arborist or tree care professional. You can easily care for them, but you should watch for signs of disease and overgrowth. 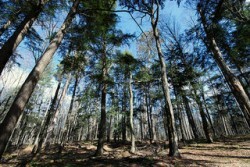 The tallest tree in the area is the white pine, coming in at around 176 feet. The smallest is the crape myrtle at 6 feet. Dwarf varieties of the crape myrtle can be groomed and trimmed back to an even smaller size. Disease is prevalent in the Durham area. Be on the lookout for the following disease issues that can affect your trees: powdery mildew, pine wood nematode and scorch disease. Powdery mildew is a type of fungus that focuses on fruit bearers such as peach, plum, pear and crabapple trees. The mildew spreads airborne and is very hard to get rid of. If you suspect that your trees, shrubs or plants are affected by powdery mildew, contact an arborist or tree removal service. The pine wood nematode attacks pines and other trees such as the spruce. It is often spread by the longhorn beetle. They can infest a tree quickly and cause the tree to die within 30 to 90 days. Root rot, yellow coloration and falling needles are a telltale sign of this disease. Scorch disease is caused by a bacteria that hones in on certain shade trees in the Durham area. This is a serious condition that causes an unhealthy leaf appearance. It will eventually kill the tree and can be easily passed on to other nearby trees. Affected trees should be removed and destroyed. Some trees cause trouble as they are rapid growers. They can easily encroach on power lines, other trees and outbuildings on the property. Examples include white pine, sycamore, mulberry, walnut and leyland cypress. Troublesome trees may also harbor disease or bear a lot of fruit, which can attract pests and insects to your yard.